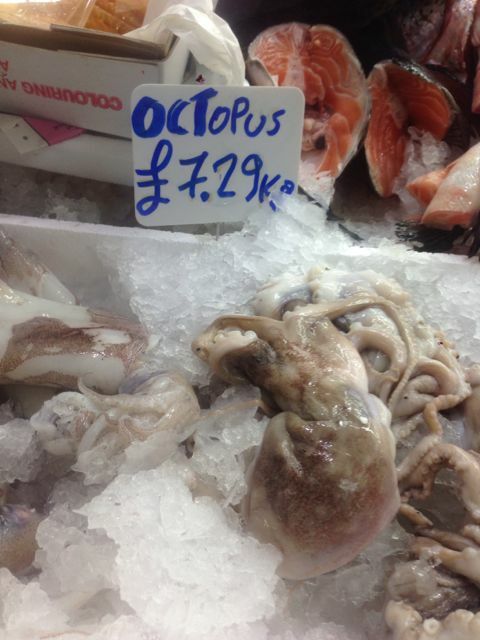 This post has nothing to do with octopuses, it just so happens that I won a bet with a friend today that you could buy octopus in Tooting Market. That was the main excitement of the day. I’m relatively relaxed about repetition, because over the years a few dancers have told me that sometimes it’s nice to hear something familiar, either because they like it, or because it’s easier to think forward about what’s happening next in the exercise. With music that has lots of different sections, like waltzes and codas, it can be satisfying to anticipate the bit you know comes after the one you’re hearing now. Maybe it’s your favourite bit, so you might just do the allegro twice if that bit comes up soon. Association helps: hackneyed though it may be, hearing Don Q might just put you in the right frame of mind, or be reassuring in its familiarity when you’re trying to do something difficult. I’m fine with that kind of considered, conscious repetition where you think “On balance, it’s probably better to go with a coda they know, even if they’ve heard it a thousand times.” There are other times when you can play something you’ve played a lot already, but it’s for a completely different exercise, or it happens to be just perfect for a particular thing, so that mitigates the repetition. What makes me anxious is when it’s Thursday, it’s ronds de jambe, and you just cannot get rid of the lugubrious, pot-stirring Viennese operetta waltz tune that descended on your brain like bad weather on Monday; or you inadvertently start playing the same thing for pliés that you played yesterday, and you’ve started, so you have to finish. Then there are those times when someone sets an adage that needs something for which you have the perfect music, but it doesn’t bear listening to too many times. When the exercise starts, you realise that it’s longer than you thought, so you have to repeat the same piece four times. Then there’s three groups. Then they repeat it. Then there’s “one more group.” A lot of the fear of repetition is as a result of the fact that teachers sometimes set exercises for which the bandwidth of really appropriate music seems very narrow (though maybe I’m mistaken – maybe they wouldn’t care what I played? I don’t know). An example is the slow rather dull tendu, for which the slow, rather dull The Two Guitars (that Russian folk-ish song ) or the slightly less slow and dull Adios Muchachos seem to work every time, like nothing else. Can I find something else that does the same thing? Not easily, though I keep trying. What I do to avoid it is improvise, hoping that bad improvisation is harder to spot than repetition. Please don’t answer that question. This entry was posted in Dance, Music and tagged Advent calendar 2014a, Music, ballet class, ballet class accompaniment on December 2, 2014 10:32 pm by Jonathan Still. This is the thirtieth article I’ve read of yours in the last hour. I JUST found your site after a playing a frustrating class this evening. I have played confidently for more than 20 different teachers over the last three years, but eh woman I played for tonight would not be happy with anything. I am so happy to find some one who knows all my fears and anxieties(repetition is a huge fear of mine) and also has so many solutions and resources. Thank you thank you. Thanks for the feedback! So glad to hear you found the site at the appropriate time. Since writing those articles last year, I played what felt like my worst class after nearly 30 years doing it; it seems like there’s no escape from that feeling, or from the teacher that’s going to make you feel it one day!